Fournier Irrigation South specializes in repairs and maintenance of existing irrigation systems, installation of new systems and installation of pond aerators. We are a family owned and operated business who truly cares about what we do. We are fully licensed and insured. We are located in Harwinton, CT and proudly serving Litchfield County Connecticut and beyond. At Fournier Irrigation South we use only the best products that are water efficient and lead in irrigation innovations. 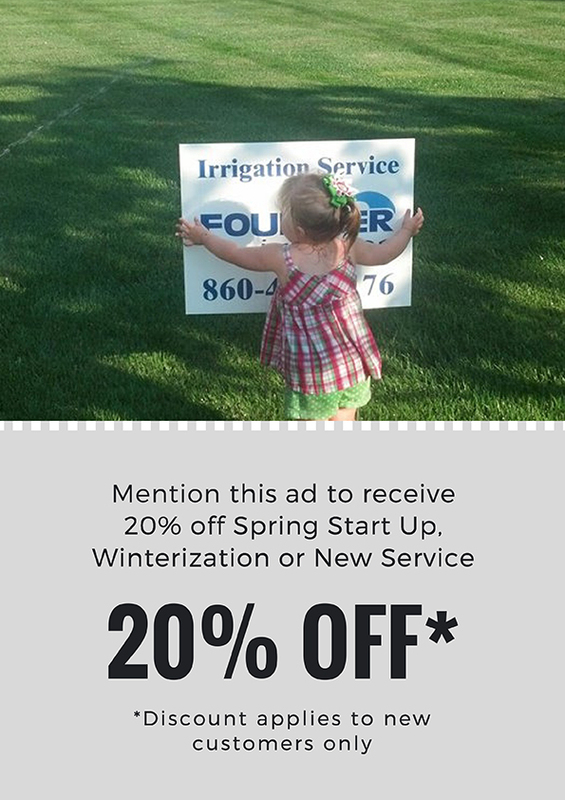 We are a company that you can trust and rely on to make sure your irrigation system is efficient and properly working. We back up our work and products with a 2 year warranty. Please take a moment to browse through our site to learn more about Fournier Irrigation South and why we are the company for you. New customers should take advantage of our 20% off promotion going on now. Please call for details (860)454-5176. Please take a minute to browse through our site to know more about Fournier Irrigation South and why we are the company for you. If you have any questions feel free to contact us.